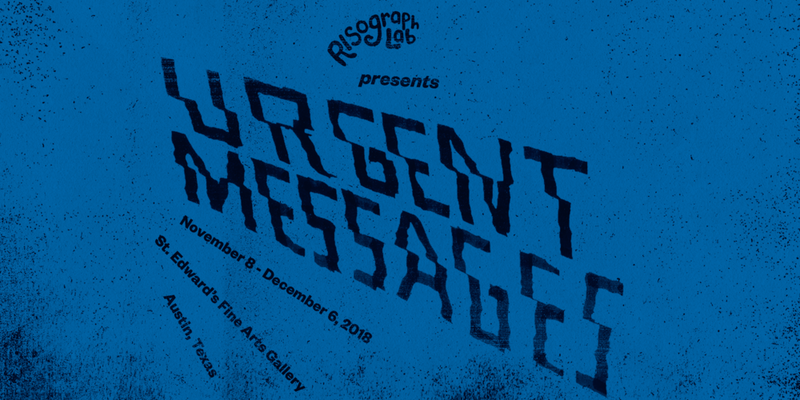 Risograph Poster Workshop: URGENT MESSAGES! Messages surround us everywhere we look. We are in fact, saturated with information. How do certain messages gain our attention, and what does it mean for a message to be urgent? “Urgent Messages” is an exhibition in the form of an extended poster-making workshop. Viewers are asked to consider an urgent message they want to deliver—is it political, personal, funny, or absurd? Is it a cry for help, a missive of hope, or a proclamation of wisdom? We provide the means—a risograph printer and a kit of pre-made graphics commissioned for the exhibition—and ask workshop participants to design posters that relay their urgent message. Participants receive an edition of 20 of their posters to take with them to put out in the world. Each participant receives an edition of 20 two-color posters to take with them to put out in the world. Enter through the South Congress Street entrance. At the first stop sign, turn left and park in the parking lot on the left. The Fine Arts Building is directly west of the parking lot. The Fine Arts Gallery is located next to the main lobby.